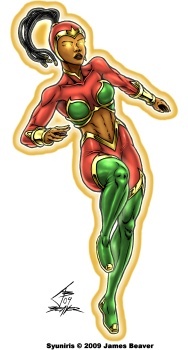 I created Syuniris, a tribute to many of my favorite female superheroines, sometime around 1996 . Though her actual characteristics, powers and name have changed a lot, her design has barely changed since the old drawings. The braids were inspired by actress/choreographer Jossie H. Thacker (In Living Color, "Remember the Times" video by Michael Jackson) because it looked cool to see them in motion as she was dancing and I thought they'd look good for a flying character. 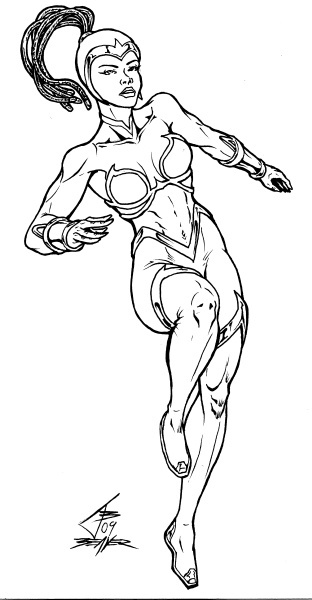 I'm still reworking some of her powers so I didn't draw her firing energy yet. I used to flip-flop about how the outfit's arrangement of red and green with gold accents should go and this is similar to one of the old choices. BTW: Syuniris appears in a sphere in that good ol' Entity pic from 1996. Just click on Syuniris' character link then click on the Entity (blue hooded guy) pic. You'll see her just a bit above the Entity's right shoulder in a red, gold and green outfit.